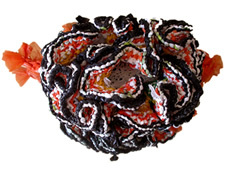 This large-scale, constantly mutating series of handmade crochets replicate the forms of natural coral and is an ongoing, growing project. The project, organised by the Los Angeles-based Institute For Figuring is a direct response to the plight of coral reef from pollution and global warming. Fusing science and mathematics with fine art and handicraft, the reef is constantly updated by an ever-expanding group of participants from around the world. The Crafts Council in partnership with Southbank Centre. Usurp’s Hyperbolic Crotchet reef structure, entirely created from recycled Indian and English plastic bags is part of the show at the Southbank. “The exotically shaped creatures that began to sprout silently all over the cozy lecture hall were soon spilling onto empty chairs and into women’s laps and shopping bags. When fully grown, these curiously animate forms will find a home as part of a mammoth version of the Great Barrier Reef. But at the moment they were emerging at a remarkable pace from the rapidly flicking crochet hooks wielded by members of the audience.” Patricia Cohen, New York Times, 4th March 2008.